This cheese is a good companion for jams, who has not tasted the typical goat cheese with tomato jam canape? This combination, but goes much further and is more surprising: provolone, with its spicy, perfectly matches our orange marmalade. 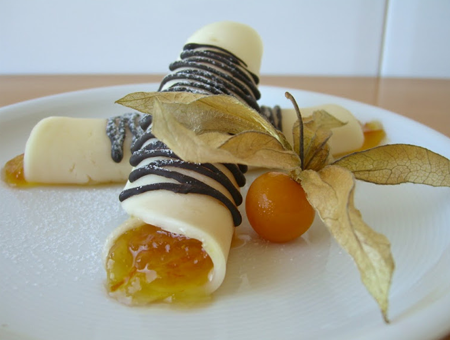 Presented as cannelloni and decorated with chocolate, original desserts are easy to make, that will put the sweet spot for a meal inspired by the cheeses of our neighboring country. Make rolls with blades canotillos shaped cheese. Fill with orange marmalade and leave in the refrigerator 20 min. Before serving, melt the chocolate in a double boiler. Cover part of the rolls with chocolate and powdered with icing sugar.